"It's been this ongoing question of, well, where were they?" says Lauren Sallan, a paleobiologist at the University of Pennsylvania. "Where were they hiding? What were their environmental origins?" Sallan Ivan J. Sansom of the University of Birmingham and colleagues are the first to present a wealth of evidence to answer that question in a report out this week in the journal Science. And the answer, it seems, is near shore, the areas often describe as the intertidal zone, or shallow lagoons. "In modern conceptions, we see that coral reefs are so important for fish biodiversity, so we assume there's an ancient link between fishes and reefs going back to the beginning," says Sallan. "But decades of searching in places like the Cincinnati Arch have come up empty." "Instead, our work shows that almost every major vertebrate division, from the earliest armored jawless fish all the way up through sharks and our own ancestors, all started out right near the beach, far inshore of the reef. Even as older groups spread out, newer groups were also appearing at the shoreline." The findings help explain important features of the fossil record, such as why so few early fish fossils are found intact; the wave action of the shallow ocean area likely blasted them into tiny fragments. 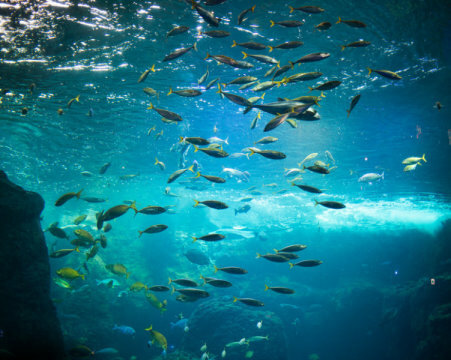 It also helps scientists make sense of the fact that, over evolutionary time, many fish groups moved from ocean water to freshwater with some becoming freshwater fish while others evolved into the earliest tetrapods, land-dwelling vertebrates. "They often went to freshwater before the reefs, which is almost an independent line of evidence that they would have had to have been close to shore before doing so," Sallan says. Exactly where vertebrates originated and diversified has been a hotly debated subject in paleontology. Certain groups of fossils from this key period in the middle Paleozoic Era told one story -- perhaps a freshwater site of origin -- while other groups may point to a birthplace in the open ocean, and still others popped up in other habitat types. Further complicating matters, the origin story of invertebrate biodiversity seem settled: They diversified around coral reefs, their descendants subsequently striking out to inhabit shallower or deeper waters. Sallan, Sansom, and colleagues decided to investigate the question for vertebrates using a big-data approach. "The nice thing about the fossil record is that we often find fishes in the context of where they live," Sallan says. "The rock that holds them tells us what their environment looked like, whether it was reef, shallow water, deep water, a riverbed, or a lake." Bringing that environmental context together with what was already known about the family tree relationships of vertebrates from the middle Paleozoic, 480 to 360 million years ago, the researchers created a database that involved 2,728 early records for jawed and jawless fishes. "It's a really huge new dataset," says Sallan. The team was then able to reconstruct the missing information in the fossil record using mathematical modeling, allowing them to make informed predictions about the habitat type in which the earliest ancestors of various vertebrate groups emerged. "For vertebrates, we find that they're originating in this unexpected, really restricted shallow area of the oceans," Sallan says. "And they stay in this limited area for a long time after they emerge."